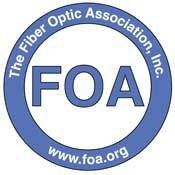 What Is The Fiber Optic Association? The FOA online database of installers, contractors and consultants is no longer available. If you need verification of your FOA certification, contact the FOA office by email or phone. If you are looking for installers, contractors or consultants, the FOA will run your requests in our monthly newsletter free. Contact the FOA office by email or phone. Call 1-760-451-3655, write or email your questions to The FOA office. Or check out the rest of The FOA web site. (C)2009, The Fiber Optic Association, Inc.